Created by the sorceress Wínyan Núpa, this hand-crafted book is bound in human skin, and consists of seventy-seven sketches of Native American women, ranging from pre-Columbian princesses to modern Sioux maidens. 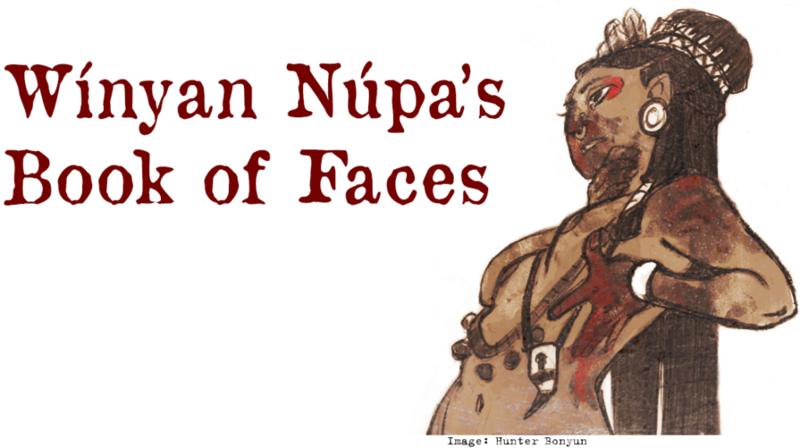 They all depict Wínyan Núpa’s various “hosts,” the women she convinced to offer their bodies and souls to the sorceress during the Ritual of Rebirth. The sketches were drawn by Wínyan Núpa herself, created in the weeks before she departed an old body to occupy a new host. Each sketch is artfully accomplished, occupying a full page and accompanied by some memento of sorts—a strip of cloth, a lock of hair, a tooth, a smear of blood. The style changes across the years depending on available materials and artistic norms, but each sketch seems magically preserved. Mysteriously and perhaps ominously, a few pages have been torn out. Wínyan Núpa’s Book of Faces is more than a mere scrapbook—each sketch contains a tiny fragment of its subject’s spirit. Anyone with an Arcane Background can sense this latent power, and if the book is obtained, they may use this to their advantage. Once per lunar cycle, one of the seventy-seven “faces” may be burned. If the destroyer liberates the bound essence, they are rewarded with a +2 Spirit Kicker. If they absorb the essence, they are rewarded with a one-time Fate Chip. In times of emergency, an additional page may be burned before the lunar cycle is complete. This requires the possessor to spend 10 Power Points and make an appropriate Arcane Background roll against TN-6. A success grants the desired reward, while a failure simply wastes the page. This may be enacted as often as the possessor desires, but only one “reward” may be active at any given time. The Book of Faces contains several Powers that may be learned by Arcane characters. Each Power requires twelve hours of study, after which a Smarts roll coupled with a successful Spellcasting roll permits the Power to be purchased through the usual methods of spending XP. If either of these rolls fails, the supplicant may try again, devoting 24 hours and making both rolls against an increased Target Number of 8. A second failure renders the Powers unlearnable, at least through Wínyan Núpa’s Book of Faces. The Powers described in the Book of Faces include: Bad Powder Medicine, Call Weather, Oblivion, Ritual of the Black Sipapu, Walk the Ghost Roads, and Wilderness Ally. All of the normal restrictions for these Powers apply. The image heading this page was created by artist Hunter Bonyun, and was borrowed from DapperDeerLord’s tumblr page. It represents the Aztec goddess Tlazolteotl, one of the inspirations for Wínyan Núpa.